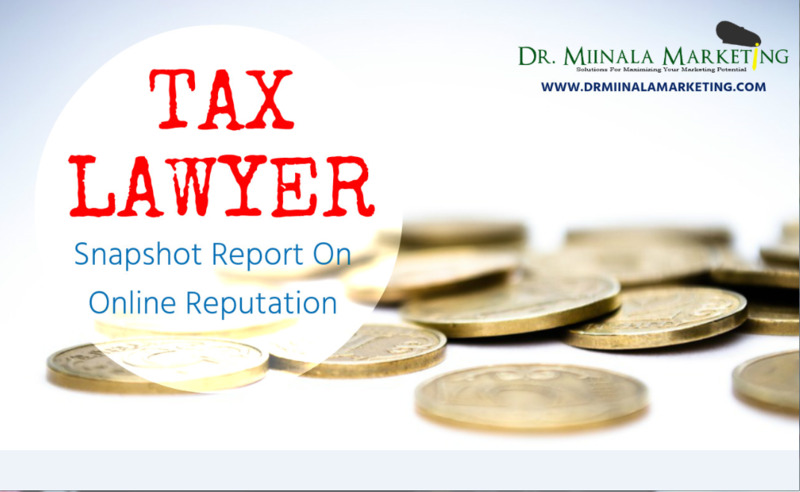 Dr. Miinala Marketing is now offering free snapshot reports on the online reputation of tax lawyers. As can be seen on Dr. Miinala Marketing's Facebook page at https://www.facebook.com/drmiinalamarketing/, the company focuses specifically on providing people information on how to increase website traffic, often focusing on specific industries. The snapshot is designed to show how tax lawyers are faring when it comes to their reputation on the internet so that they can do something about it if it comes out to be less than stellar. A company spokesperson says: "Our goal is to make local marketing and online reputation building easier than ever. Different industries need to use different types of tactics to make sure things work for them, which is why our current focus is specific to tax lawyers. We expect to be able to deliver similar services for other industries very shortly and will inform people about this on the website and Facebook page as soon as we can." While the snapshot report is designed specifically for tax lawyers, all businesses can access the free reports on local marketing. This is offered through Dr. Miinala Marketing's website on http://drmiinalamarketing.com/free-reports/. This report will show businesses what their current online standing is, and what they can do to improve on that. While the report is completely free and no obligation, they will be more than happy to work with clients to help them improve.